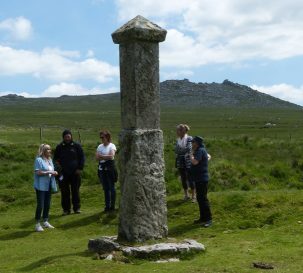 Follow in the footsteps of Charlotte Dymond, supposedly brutally murdered by her lover on Bodmin Moor. Author Jane Nancarrow will take you to Roughtor, the scene of the murder, and to Davidstow Church where she is buried. Listen to Charles Causley’s ‘The Ballad of Charlotte Dymond’ and other readings by Jane. Bring your own picnic for lunch, and stop off at the Terre Verte Gallery in Altarnun on return, for an afternoon cup of tea. Please bring suitable clothes and shoes for walking. Please also note : the distance from the car park to the Charlotte Dymond monument is not far, but is across rough terrain and not suitable for wheelchairs.